The Greenfield Treestand (also known as J.A. & W.E. Werner Parks) is a linear urban tableland forest consisting of aspen and balsam poplar trees with a healthy understory. The stand is separated in its middle by 114 Street with the larger of the two sections located on the east. This treestand provides habitat for many urban-adapted species of birds and small mammals; however, due to its size and location within a predominantly urban area, does not provide habitat or connections for larger and non-urban species. The site does offer an excellent opportunity to view native vegetation and wildlife in the heart of the city’s south side. 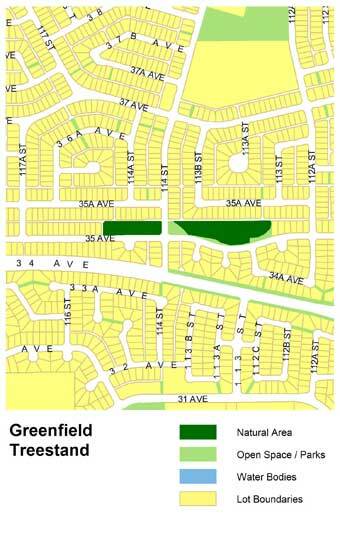 This site is located within the Greenfield neighbourhood at 11248 35 Avenue. Access and parking for the Greenfield Treestand can be found along local side streets as the natural area is mostly surrounded by roadways. Sidewalks and formal grassy areas provide excellent views of the area and benches are also available in some locations. A network of unimproved trails within the interior of the treestand can also be accessed. 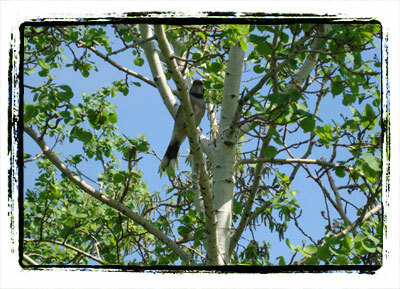 The Greenfield Treestand provides habitat for many urban adapted bird species such as robins, chickadees, crows, and blue jays. Habitat for small mammals is abundant throughout the stand.